While market activity remained brisk, average house prices fell in seven out of ten regions in England and Wales in the past month. A seasonal dip in house prices is not uncommon this time of year but signs point to a more general slowdown. Reports show buyer demand is beginning to tail off. Hometrack’s monthly survey of estate agents and surveyors indicates there was no growth in new buyers registering with agents in June and a further decline in new buyers registering (-0.9%) in July ; a shift in trend from the past 18 months. While it is still viewed to be a good time to sell, buyer confidence is softening with talk of stricter lending criteria and a possible interest rate rise in 2015. The Halifax Housing Market confidence tracker indicates 57% think it is a good time to sell in the next 12 months (highest since index began in 2011), while those who think it is a good time to buy, is down by 29 points in the last quarter. 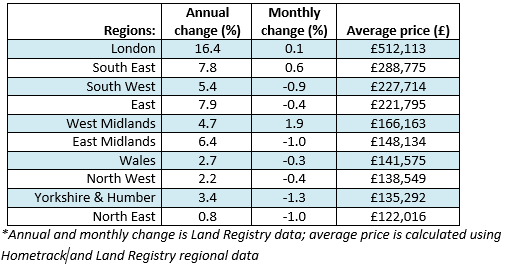 In the past month, prices fell in all regions but the West Midlands, South East and London. 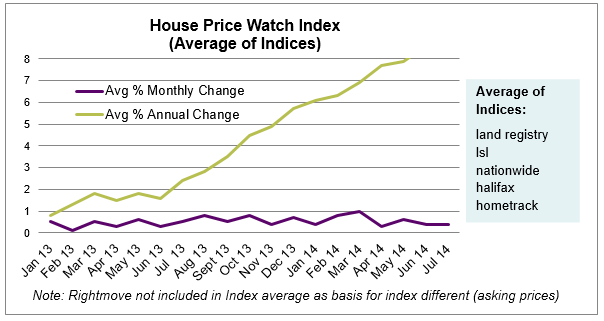 The momentum of price rises in the London market is slowing.